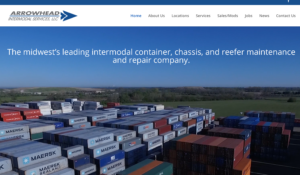 Arrowhead Intermodal Services, LLC is pleased to announce the launch of their brand-new website. The site’s focus remains on the key services of the company such as depot services, refrigeration services, maintenance and repair and mobile repairs. However, a page is now specifically dedicated to the sale of intermodal equipment such as generator sets, chassis and modified containers of all shapes and sizes. The social media pages include a company page on LinkedIn and corporate pages on the major social media sites: Facebook, Instagram and Twitter.